Gyula Halász, otherwise known as Brassai (his pseudonym), was a well-known Parisian photographer. 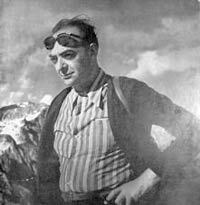 He was born in September of 1899 in Brassó, which was then part of Hungary. When he was three years old, Brassai and his family moved so they could reside in Paris for a period of one year. His father was a literature professor who was based in the Sorbonne in Paris. In his youthful days, Gyula was interested in art, specifically in the study of sculpture and painting. He went to study these subjects at Hungarian Academy of Fine Arts in Budapest. He then joined a cavalry of the Austro-Hungarian army and served until the First World War ended. In 1920, Brassai moved to Berlin and started work as a young journalist. During this time, he also pursed his talents at Berlin-Charlottenburg Academy of Arts. In 1924, Gyula moved back to Paris. He was interested in learning French and he did this by reading books written by Marcel Proust. Gyula got a position as a young journalist and he soon formed friendships with the likes of Leon Paul, the poet Jacques Prevert, and Henry Miller, all of whom added some positive influence on his life. Brassai loved his job and had a passion for the city. He often wandered into the streets until late at night looking for something beautiful to capture. According to him, photography allowed him to be able to seize the beauty of Paris at night. He loved how the gardens and streets lit up the night. This was the point at which Gyula Halász changed his name to Brassai, which meant “from Brasso,” the place of his birth. Brassai loved the city and he captured its beauty and essence in all his photographs. In 1933, he published his first book entitled Paris after Dark. His book was very successful and Henry Miller gave him the nickname of “Paris’s eye.” Brassai also took popular photographs from the angle of life of the high society. He showed the city’s intellectuals, its ballets, and even the grand operas. Gyula also took pictures of some of his artist friends, including Pablo Picasso, Alberto Giacometti, and Salvador Dali. Some of the writers of his time that he photographed included Henri Michaux and Jean Genet, among many others. His work brought him much fame both locally and internationally. This led to one-man shows in the United States at the Art Institute of Chicago, Illinois, and the New York City Museum of Modern Arts, among other venues. In 1956, Brassai’s film entitled Tant qu’il aura’ de’s bêteswas recognized as the “most original” at the Cannes Film Festival. In 1974, he was named Chevalier des Arts et des Lettres and also named Legion of Honor in 1976. In 1978, Brassai also won the Grand Prix Nationa’l de’ la Photographie award in Paris. Gyula was famous for other things besides photography, including such accomplishments like being the author of 17 books and numerous articles. In 1948, he produced a novel named Histoire’ de Marie, which was published alongside an introduction written by Henry Miller. Chicago Press University also translated and published his Conversations with Picasso and his article Letters to My Parents into English. Brassai is generally considered one of the influential photographers of the 20th century. He passed away in July of 1984 in Eze, France. In 2000, an exhibition was held in recognition of his works. The exhibition was organized by his widow, Gilberte, and it featured 450 works by Brassai.